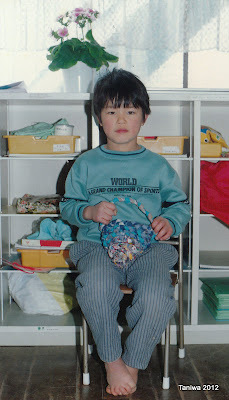 The oldest kindergarten class (age 5) is working on braiding and sewing baskets. This is a long term project that the teachers have been demonstrating and teaching for the last couple of months. The mothers prepare strips of fabric and the children learn to sit on the floor with three knotted strips planted firmly between their toes, and then they braid towards themselves. My contribution to this project was years ago when Leiya was in kindergarten and I realized that the teachers were running around sewing strips to strips for the children. "There is an easier way to join those strips. Just make a slit at the end of each strip and "thread" one end through both slits... You get a knot but at least you don't have to do extra sewing." The kindergarten teacher at the time was just thrilled to know I'd saved her a lot of work! And in this season most of the children have finished braiding their strips and are now working on sewing the rope around and around to make a coil basket. Look at all those little fingers poking away at their braided baskets. Pretty little 5 year old fingers! Basket making must be a fairly successful kindergarten project because the kindergarten has been doing it for... let's see... at least 22 years!!! 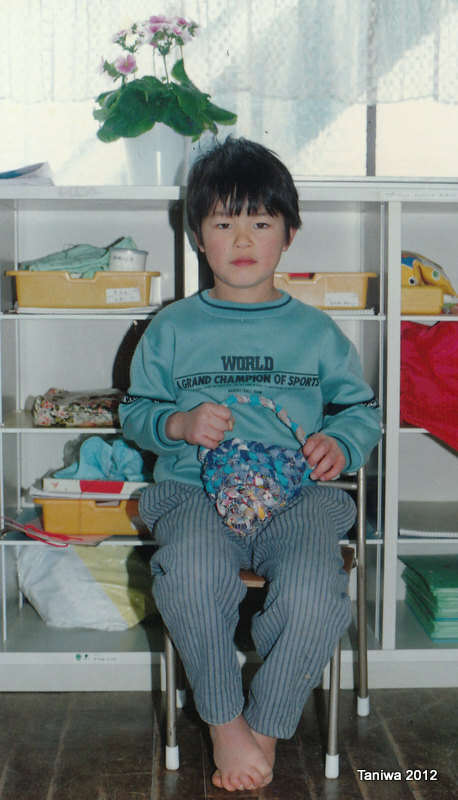 Here is a picture of Takumi showing off his basket when he was 5! It must have been a cold season when this picture was taken. Look at how he is keeping his toes warm!